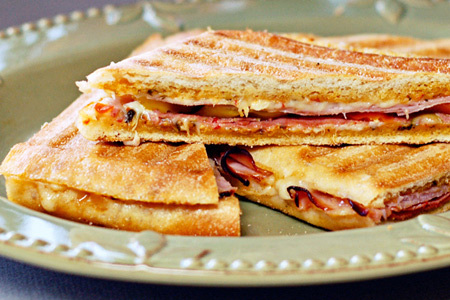 This sandwich is my funky twist on a muffaletta. It's one of those recipes that I made up on-the-fly while doing the, "What in the world am I gonna make for dinner?" mental gymnastics on my way home from work last night. I wanted something quick and easy, yet new and interesting. As I was parking at the store I remembered this great sandwich recipe from chef Anne Burrell. I didn't remember the entire recipe, but I did recall enough to be inspired by it. This happens to me alot. Here's how the rest of this little culinary adventure went down. 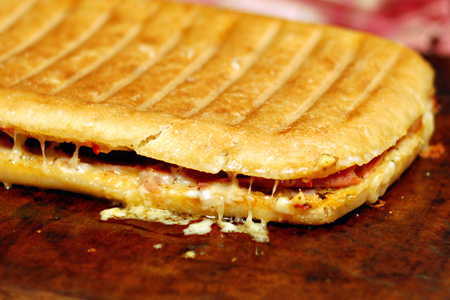 I grabbed a loaf of take & bake ciabatta and that's when I came up with the "panini-style" idea. 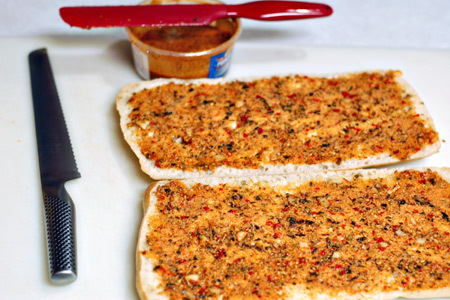 The bread needs to be baked anyhow, so why not try something new? A panini would be great, and while I don't have a panini press, I do have a baking stone and a large cast iron griddle with a grill on the other side. Bingo! It was a true Alton Brown-esque moment. Next I went looking for something to approximate the pepper relish that Anne used. As I scoured the shelves I saw a small jar of roasted red pepper tapanade. It looked promising (albeit expensive), so I threw it in the basket. Cheese was on the list of needs, and while in that section I realized that I had plenty of various cheeses at home. Just as I moved along I discovered something even more interesting to replace the relish — roasted red pepper pesto. "Ah yes, that's even better. ", I thought. I hit the pickle aisle because I needed something to add a vinegar twang. I grabbed a jar of mild pickled banana pepper rings. My girls dig just about anything pickled, and I thought these would add not only the needed twang, but also a great texture and another dimension of flavor. Now I needed the meat. 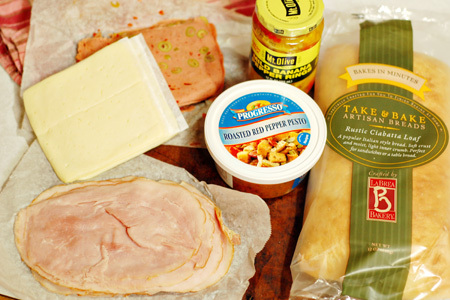 I am a huge fan of Boar's Head deli products. Their stuff is a little pricey, but the quality is definitely worth it. While the deli dude was slicing my tavern ham (like Black Forest, but a little sweeter with a lighter smoke), I saw the olives that I was lacking. What is a muffaletta without olives? The olive loaf was calling me. Yes, olive loaf. This is at least the third time that I've ever in my life bought olive loaf. With all the ingredients in hand, it's time to make a stellar sandwich! Put your baking stone on the center rack of your oven, and your cast iron griddle on a lower rack. Note: If you don't have a cast iron griddle, a large cast iron skillet will work nicely. 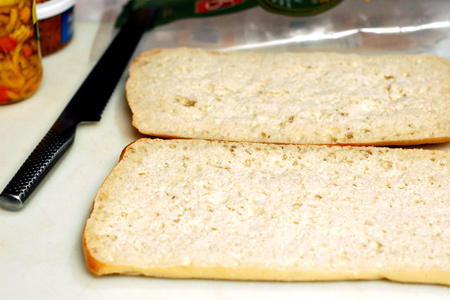 Split the loaf of bread in half horizontally and press down on the internal bread of each half to compress it. Spread half of the pesto evenly on each half of the bread. Cover each half of the bread completely and evenly with the cheese. Arrange the ham evenly on one half of the bread, and the olive loaf on the other. Distribute the pepper rings evenly on one half. Put the sandwich in the center of the baking stone. 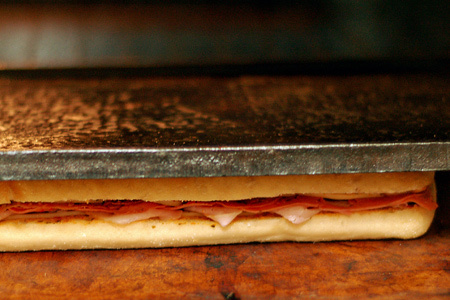 Very carefully center the griddle on top of the sandwich. Note: It's important that it be centered so that it doesn't slide off in one direction as the sandwich cooks. This happened to me. 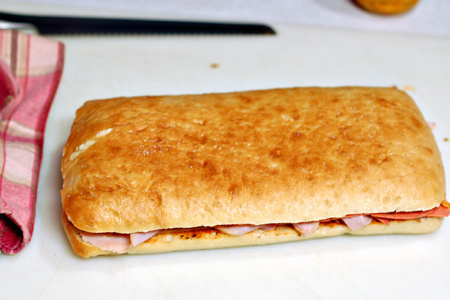 Bake the sandwich for 15 minutes, or until the edges of the bread are golden brown and starting to crisp. 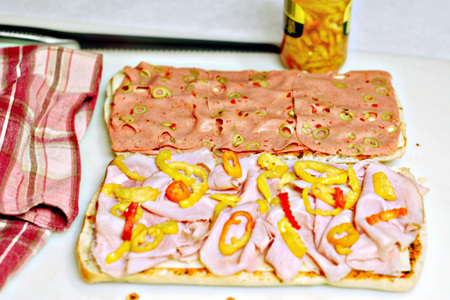 Remove the sandwich to a cutting board. Man, that looks good. I can't think of olive loaf without remembering a schoolmate whose mother put it in her lunch fairly often. She would open her lunch on the bus in the morning, and when it was olive loaf, she would exclaim, "Ewwww, fruit meat!" Ha! Olive loaf does seem to have a bad rep, indeed. Very creative John! For not having a press, you sure nailed the perfect look of one. Very artistic! I probably wouldn't be able to stop eating them. They look great! Holy cow that looks so good! Love the photography as well. That looks delicious, we are going to make it tomorrow for lunch as the family will be coming round, and I think they will loves this.